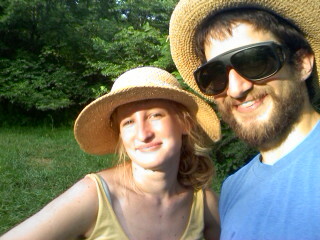 Recently we were given (by this we mean that they were left in our trash can behind our house) some new hats. Actually, 6 to be exact. many had silk flowers and other adornments. but all were very retro, and very much something that a sylish lady would wear to church 40 years ago. Well now we’ve got half a dozen hats that shield our faces from the sun and make us look silly -2 things that we’re very interested in doing these days.